I have been craving for good Indonesian food for a while now and I have yet to find a decent place in Hong Kong! 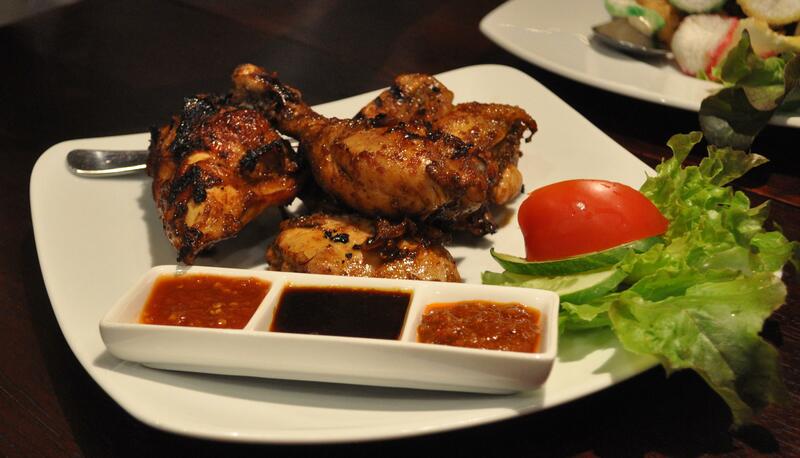 There are SO many ‘good’ Indonesian restaurants in Sydney – especially if you go to Kensington or Kingsford where all the Indonesian eateries are! You can pretty much get whatever you crave for on that street! I had my doze of bakso goreng from Pinanggsia that week as my brother was kind enough to get some on my first night there. 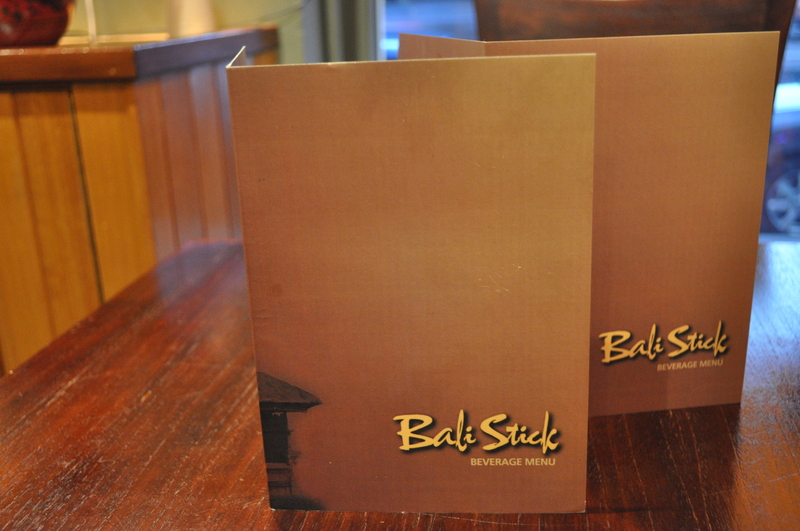 I wanted something more substantial than just ayam goreng (fried chicken) so we went to Bali Sticks. Bali Sticks is relatively new compare to the others. It has only been open for a couple of years (not even that) and there’s live music most weekends. We were starved, well I was! So we ordered a few dishes consisting of those I was craving – ducks, chicken, fish and veggies. The ayam goreng (fried chicken) came first and this was totally utterly delicious. The chicken was slightly marinated with honey – it was slightly sweet but yet tasty. The chicken was moist and tender and was extremely flavoursome. The bebek betutu (duck with Balinese sauce – famous Bali meal) and urap (special salad with coconut shred) was not a favourite of mine but the duck was extremely tender that the meat just fell off the bone. The urap was extremely tasty, however I think I prefer my duck fried instead of steamed. 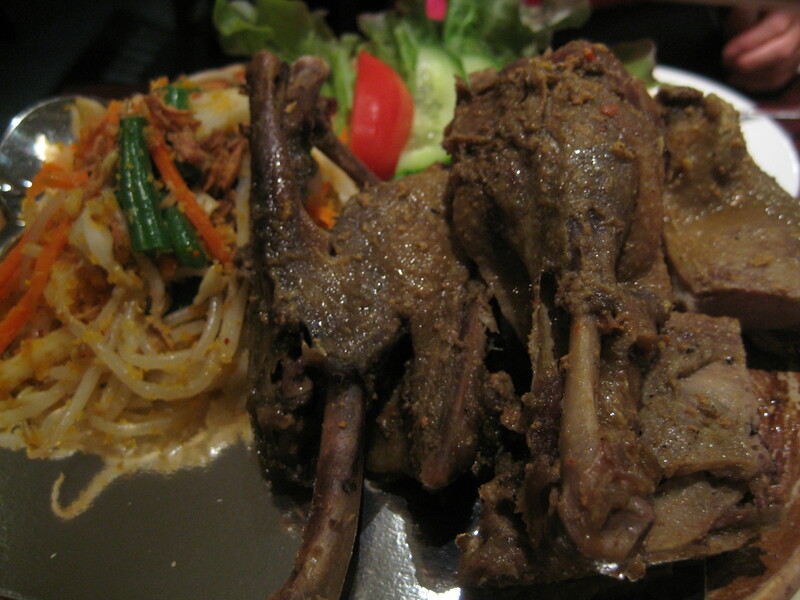 The duck had a lot of flavour – it was spicy, and infused with coconut oil. 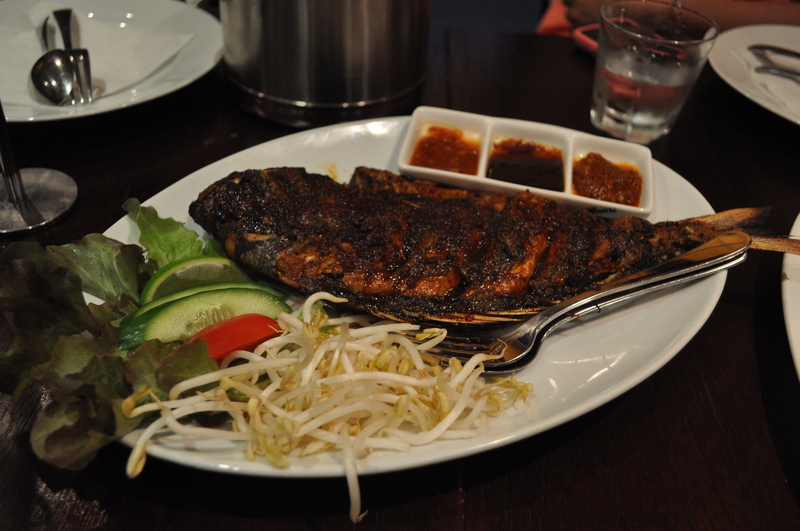 The fried garoupa was a favourite. Even though the fish was deep fried, it was still quite moist and tender. It wasn’t dry and extremely flavoursome. 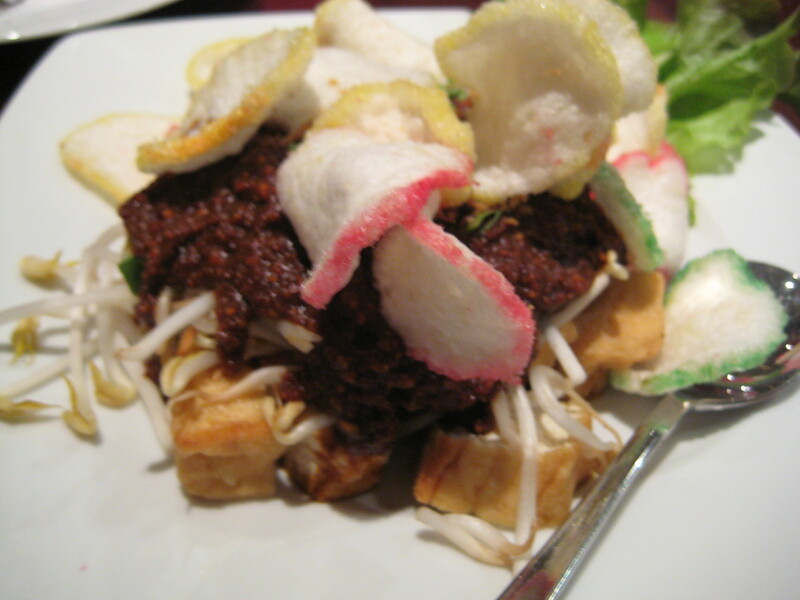 Tahu campur, which tofu with bean sprouts and peanut sauce, is a very simple dish. As long as all the ingredients are fresh you can’t go wrong and the ingredients were all fresh! The peanut sauce I thought was a little dry – however it was still quite tasty and authentic. It was spicy which gave it a nice surprise. I can’t remember the name of this last dish (SHAME ON ME I KNOW! ), however it consisted of spinach, carrots, bean sprouts and tofu with peanut sauce. The sauce was similar to the tahu campur but this dish was without doubt tastier. It was indeed spicy and too much of this would have made my eyes water but it was light and the mixture of all the vegetables were just outstanding. I noticed on their drinks menu that they had es duren. In my mind I was thinking durian juice, however, it wasn’t the case. 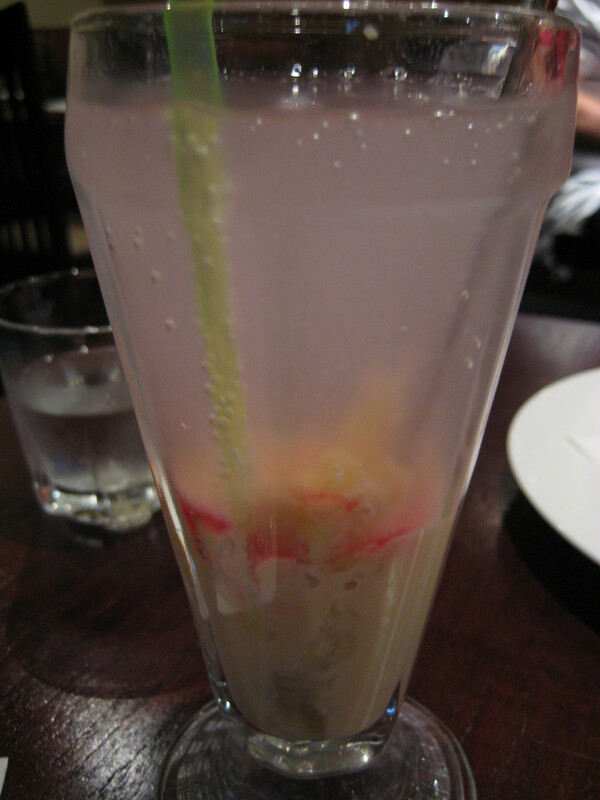 It was similar to soda gembira which is sweetened condensed milk, thick red strawberry syrup and club soda together in a glass. My es duren was club soda with durian in it – it was a tad bit weird I thought, but the durian was fresh and tasty! My only complaint would be that there wasn’t enough durian!!!! It was a great last supper with the family before I head back to Hong Kong and it definitely satisfied most of my cravings for Indonesian food. I am still craving for some ‘good’ bakmi ayam (chicken noodles aka Indo style and I am not talking about mie goreng! ), martabak manis, sate ayam amongst others which I am sure I will satisfy when I go back in May. is the last dish ketoprak? 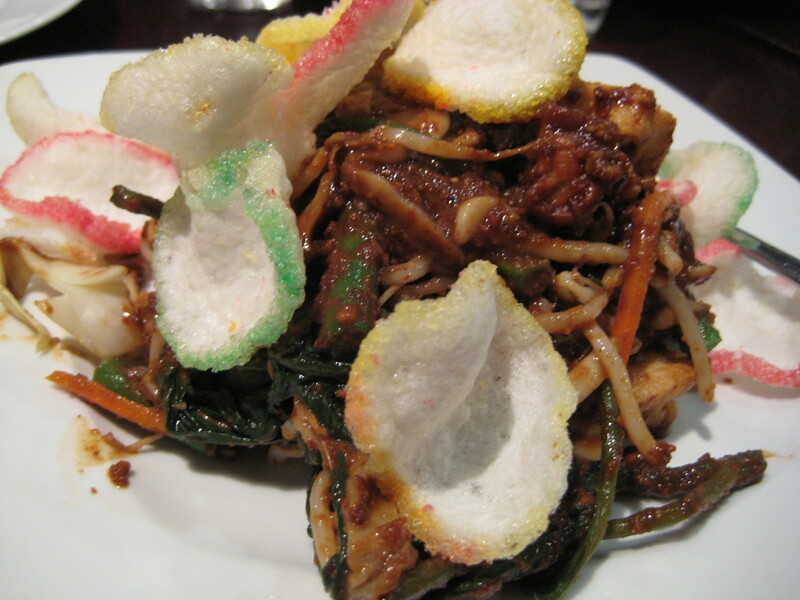 or a strange version of gado-gado? no not ketoprak or gado2 – there is a name for it which i cant remember!! terrible i know. overall a very plesant experience.